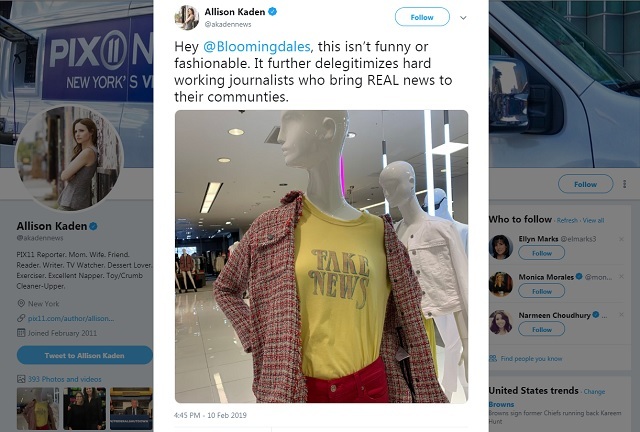 Bloomingdale's decided to pull a "Fake News" t-shirt after one journalist whined on Twitter than the fashion piece "isn't funny or fashionable" and "delegitimizes hard working journalists." [...]Bloomingdale’s responded Monday morning, thanking Kaden and promising to remove the shirt. This is the "heroism of the journo" which Jeff Bezos's $5.2 million Super Bowl ad told us about.